← Got an Idea? Get it ON your Chest! The Moon is Bright, Take a Walk and Learn! Although most kids are fast asleep (or at least well hidden under sheets with flashlights, books and/or handheld games) by the time the moon has risen to it’s rightful place in the night sky, with summer upon us it may be the time to keep them up after hours to take a walk in the moonlight and learn about what goes on in our nocturnal world. Start by checking your local listings to see when the next full moon might occur. While there is usually only one per month, on the rare occasion there are two, a phenomena referred to as a Blue moon. You can check out the National Oceanic and Atmospheric Administration (NOAA) online and enter your ZIP code to get accurate readings. Prepare for your late night out by having younger children take an extended nap during the day. The last thing you want are cranky children who show no interest because they can’t keep their eyes open. Also gather a few things together such as a sketchbook or notebook and a pen/pencil and crayons or colored pencils. Next choose a place where you will have an optimum view. This can be your own backyard, but know if you have bright streetlights or a large number of trees, your view will be obscured. It may be better to go to a local park, just make sure you have permission first from the local police department. Some towns may require you to have a permit. Take a blanket to sit on and a few snacks for younger children. This will be just like a picnic, just at night. A flashlight is always a good idea too as well as a cell phone for emergencies. Always be sure to let someone know where you are going. Allow your child to sit and have their eyes adjust to the dark. When they feel comfortable enough, have them seek out objects such as a fire hydrant, houses, trees or cars. Make a list of everything you see. Talk about how things look different at night. Are they scary looking? Now is a good time to explain that these are ordinary objects, nothing to be frightened of. 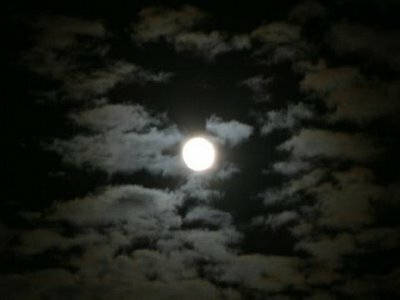 If clouds are present in the sky talk about how the moon lights up around them. Does this mean the moon is further away than the clouds? Look for shapes in the clounds, draw pictures and make up stories. A fun thing to do is to sit and listen to night noises. Many animals are nocturnal (meaning they are active at night). Explain what this means and then try to identify the sounds you hear. At this point it is not important to be perfectly accurate, just to get used to hearing the noises and recognizing that they are representaive of nature…at night. Imagine you are a nocturnal animal. Take turns telling stories about what you would do, hunt, dig, explore? Draw a picture of the nocturnal animals you imagine to be out there. You can verify these by later visiting the library or checking online. For more fun, try this game. Stand facing each other in plain view. How many steps can you take backward before you can no longer see each other clearly. Can you toss a ball in the moonlight? Look at shadows, yours, the objects around you. How are they different? You can play a sort of BINGO with the different types of shadows, shapes and sizes. 1. What makes the moon glow so brightly at times, less so at other times? 2. What are the names of the phases of the moon? Can you draw them? 3. The moon and it’s phases are know by many names, given to it throughout history either by folk stories, native tribes, etc. How many can you name? Once your lids have become heavy, carefully return home knowing that you have enjoyed a fun family activity unlike those you can do during the day. Hopefully, you will all be able to sleep in for a while! This entry was posted in Adventures and tagged Conservation, education, kids, moon, nature. Bookmark the permalink. 1 Response to The Moon is Bright, Take a Walk and Learn!